These Recommended Lightweight Backpacks are your first choice if you want one light pack to work for all your trips. These packs will carry gear and food for trips up to 7 days or more—yet at around 2 pounds they are not too heavy to use for a long weekend on the Appalachian Trail. They have an internal frame to support heavier loads and will accommodate a bunch of gear and/or a bear canister. Hyperlite Mountain Gear Packs: HMG makes very light, functional and extremely durable packs. The 3400 Southwest Pack will work for most trips, even those requiring a bear canister. The 2400 Southwest Pack is a personal favorite and a Backpacker Magazine award winner for “Best UltraLight Pack.” For longer trips it’s great for those with a more compact kit. Its slim profile gives great balance for scrambling. HMG packs have stiff frames, capable of supporting heavy loads. 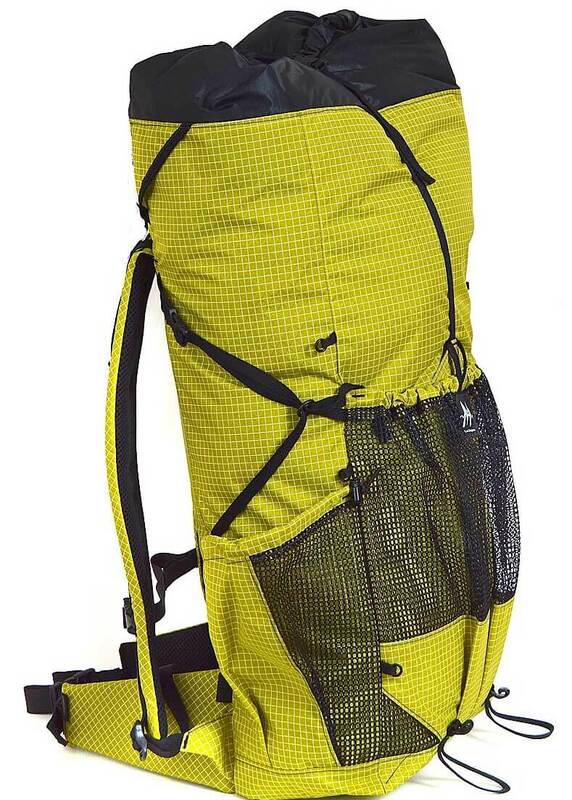 HMG packs are Cuben Fiber which is light, waterproof and extremely durable. Seam taping and a roll-top closure make these packs virtually waterproof! left: HMG Southwest 2400. Light, rugged & versatile. Can be dragged across rock. Nearly waterproof. ULA Equipment Packs: ULA packs are a great value. They have much of the performance of HMG packs but cost less. The Circuit Pack will work for most trips, even those requiring a bear canister. The Ohm 2.0 Pack is great for those with a more compact kit and/or shorter trips (although I carried gear and food for 7 days on the Southern Sierra High Route including a bear canister). Its slim profile gives great balance for scrambling. ULA packs are Robic fabric which is light and reasonably durable but inexpensive, keeping pack prices down. 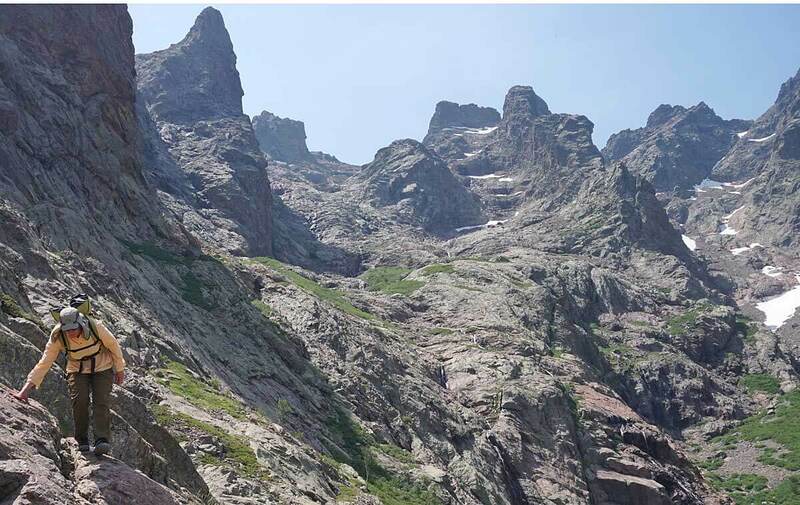 right: The Ohm 2.0 Pack: Slogging up the Mountaineer’s Route on Mt. Whitney carrying a bear canister and 7 days worth of food in a ULA Ohm 2.0 pack. Its slim profile gives great balance for scrambling and its durable construction is up to the abuse of climbing Sierra granite. In this case it allowed us to climb over the summit of Whitney mid-trip on the Southern Sierra High Route. Z-packs Arc Packs: If you hike mostly on trails, this might be the pack for you. What sets it apart is the load carrying capacity of its external frame. Z-packs does a modern, lightweight carbon fiber reinvention of the external frame backpacks of the 70’s and 80’s. Make no mistake, nothing transfers load to your hips like an external frame pack. Their Flexed Arc carbon fiber frame creates an air gap against your back, reducing that sweaty back feeling. The external frame has some considerations for off trail use. It doesn’t move with your torso as much as an internal frame pack when scrambling on rough terrain. And if you need to haul or lower your pack the external frame is exposed. It could catch on things and/or be damaged [but guessing that the majority of readers don’t haul their packs on rock]. The are Arc Haul uses more economical Dyneema fabric. The Arc Blast uses, lighter but expensive Cuben Fiber. left: Z-packs Arc Pack: What sets it apart is the load carrying capacity of its external carbon fiber frame. Osprey Exos 58 Pack: The main advantage of the Exos 58 is off the shelf availability form major retailers like REI (the rest of the packs on this page are not). At 2.7 pounds the Exos 58 is almost a pound heavier than other packs on this page but has features like a breathable, tensioned-mesh back panel frame and a top lid with a pocket that some trail hikers may appreciate. 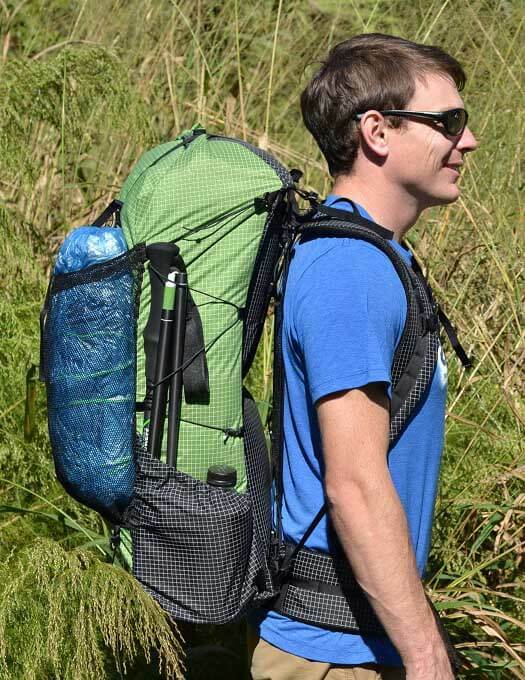 Gossamer Gear Mariposa 60 Pack: A great trail pack with a lot of volume! While not quite as durable for scrambling/bushwhacking as the HMG and ULA packs, the Mariposa is under two pounds and has a bunch of features and creature comforts, like a top lid with a pocket that many trail hikers will appreciate. These packs are a great choice for a “long-weekend trip*,” typically 3 days and 2 nights. Their main advantage is that they weigh 10-18 oz, or 1/3 to 1/2 the weight of the Do-it-all Packs. In general, these packs are suited to carrying loads of 10 to 18 pounds. As such, many do not have a frame and/or may have less capacity than the Do-it-all Packs. But some backpackers with a trim gear kit may be able to use these packs for longer tips. *Note: 90% of backpackers take 90% their trips for 3 days or or less. Mountain Laurel Designs Packs: The MLD Exodus Pack is a darling of the AT and a Backpacker Magazine award winner for “Best UltraLight Pack.” At just over a pound, it has the same volume of the Do-it-all Packs but saves weight by not having a frame. With light but durable Dyneema X fabric, it’s surprisingly strong, light and resistant to abuse. The 0.8 pound Burn Pack at 38 liters is a smaller and lighter version of the Exodus and is suitable for backpackers with a trimmer gear kit and/or lighter load. Note: Mountain Laurel Designs is now offering their Burn, Prophet, and Exodus packs in Cuben Fiber. the Cuben Fiber is inherently near-waterproof. When you combine this with a Cuben stuff sacks for your down sleeping bag and jacket, you can pretty much not worry about rain. That means less time dealing with putting on a pack rain cover (they don’t work anyway) or dealing with putting everything in a waterproof pack liner. Hyperlite Mountain Gear 2400 WindRider Pack: The 1.7 pound 2400 WindRider Pack is another winner of Backpacker Magazine’s “Best UltraLight Pack.” This pack is a hybrid between theDo-it-all Packs and Short trip packs. It has a bomber frame to support heavy loads but for many backpackers its 40 liter volume is more appropriate for shorter trips. It’s virtually waterproof and will handle a ton of abuse. ULA Equipment CDT Pack: At 1.5 pounds and frameless, the CDT is ULA’s lightest and most basic pack. Like the MLD Exodus, its volume (54 liters) is similar to the Do-it-all packs, only the lack of a frame relegates it to shorter trips for many (but not all) backpackers. Zpacks: At around 1.5 pounds the Arc Haul and the Arc Blast from Z-packs, would be a good choice for trail hiking. Especially those with sensitive shoulders that want to transfer the maximum weight to the hip belt. Gossamer Gear Packs: Heather ‘Anish’ Anderson used the The Gorilla 40 Ultralight Pack to set the speed record for the Appalachian Trail. At 1.6 pounds, the Gorilla is a hybrid between the Do-it-all Packs and Short trip packs. It has a frame to support heaver loads but its 40 liter volume is more appropriate for shorter trips. The 1.1 pound Kumo Superlight and 0.6 Murmur Hyperlight are frameless 36 liter packs suitable for backpackers with a trimmer gear kit and/or lighter load. Unique to the Gossamer Gear Packs is an external and easily removable foam back-pad. This adds a bit of structure to the frameless packs and can be used as a sit pad for breaks and in camp, and/or to put under your feet at night if you use a shorter sleeping pad. Osprey Exos 38 Pack: The main advantage of the Exos 38 is off the shelf availability from major retailers like REI (the rest of the packs on this page are not). At 2.2 pounds the Exos 38 is over twice the weight of most packs on this page but has features like a breathable, tensioned-mesh back panel frame and a top lid with a pocket that some trail hikers may appreciate. Hey Alan – I love that this thread still has activity! We met briefly last summer in RMNP. I was on Skurka’s 2B group while you were leading 2A. Anyway – do you know how a Bearikade Weekender might fit into an MLD Burn? My non-canister trips I’m 100% good with the Burn and I’d hate to have to get a bigger pack just for the trips that need a bear can. Mike nice to hear from you! Sadly, I don’t think the Weekender is going to be a good choice for the Burn. You might get a Scout or a BV 450 in it — but even that would be tight. Honestly, the Exodus is the pack of choice if you are carrying a bear canister. For more see the following in my new 2019 Best Backpacks for Backpacking and Hiking. Which Bear Canister Is Right for You? and PRO TIP | How Big a Pack Do You Need? What pack would you recommend for a load of 35-40 pounds? The reason my pack is so heavy is I need to carry 10 days of food, bear cannister, addtl clothes, ice axe/crampons. Most of the packs you have recommended have optimal weight of no more than 30 pounds. Would you just bite the bullet for the first few days and be uncomfortable with the Circuit or do you think a pack like the Atmos would be more comfortable even thought it’s heavier? Any thoughts on the My Trail Co, UL 35? If you have TPW around 15lbs do you need the aluminum stays (in the HMG pack)? Done a few trips now with my bpw at 8lbs and my Southwest 2400. Even though I’m happy with the set up I know I can shave another pound by going frameless (mld burn?). Any reasons not to switch out my HMG pack? Talk me out of it. Alan, thanks for the article. I’m an average weekend backpacker who is a novice and starting to upgrade much of my gear to go lighter. I don’t necessarily aspire to be super Ultralight but getting into my mid 40’s now and want to enjoy the journey more. That being said I prefer larger volume packs as not all my gear is Ultralight , I sometimes carry couple items for my daughter, I want a do it all pack for weekends and eventual longer, deep three season trips. I’m really struggling between the GG Mariposa 60, ULA Circuit, and maybe even one of the larger HMG Cuben Fiber packs but can’t get past the white color and lack of pockets. Which one would you recommend for someone like me? Alan, first of all your website is filled with priceless information, planning a hiking trip to Patagonia in November/December and was having difficulties finding the logistical information, thank you so much for doing this. Your information has been extremely helpful especially for planning the Torres Del Paine W trek. My question is in regards to backpacks, my husband and I are in the process of upgrading our 20 year old (HEAVY) gear. Looking at backpacks…some of the reviews I read on the ULA Ohm 2.0 and what was also on their website did not recommend traveling with this pack due to the frame not being as sturdy and prone to breakage. Did you and your wife check your luggage with the airlines? I suppose traveling on the buses in Patagonia its mostly other backpacks so maybe not a problem with heavy loads being dropped on the pack, I really want to get an ultralight pack but don’t want it to break in route. Your input on this would be great. thank you! Alan, on your custom Ohm 2.0 can you tell me a little more about the fabric front pocket. Is it pleated (with elastic at the top) to provide a little more space or is it basically just a flat piece of fabric? I am curious if it provides any extra storage like the mesh pocket or if the storage works back into the main pack body. Also, is the pack 100% robic and still only at 32oz stripped of all the extras? Thanks! Heading out for my first two week, high adventure trip this summer with my Scout troop. We are going to Philmont in NM. Finding the right pack for this type of terrain and this length of time is overwhelming. Can you give me your thoughts/basic “low down” on the packs I should consider, and why? Alan, I was considering getting the 3400 southwest instead of the 2400 to give myself the versatility to go on longer trips. Is this a good idea, or would you recommend another pack at that size? Thank you! Thanks for all of your hard work and great information on the site! I’m curious if you have ever tried Osprey’s Talon Series, I find them to personally be slightly better options than the Exos series. They’re slightly lighter than the Exos, and have frame “sheets” instead of the small, medium, and large sizes of the Exos series. The difference in being able to adjust to just the right size makes load carry way better than the Exos (for me). I two night / three day with a Talon 22, and five night / six day with a Talon 33. Granted, this is with a 9 pound base weight, to which the credit goes in no small part to the info gained on your site. Thanks Alan I appreciate your feedback. I think to it will be between the HMG and Exos I agree 40 pounds is not fun to carry, but I have considered it worth it to get the children out there. I will continue to use your site to decrease the weight. I have invested in some of your recommendations–quilts, Neoair sleeping pads, and a Cuben shelter–but I need to stop spending for awhile. I see how easy it is to get caught up in the gear addiction! With these changes I hope to keep the weight down to about 30 pounds but 2 children age 11 and 9 do not carry much! Thanks again. Hello Alan, I have been following you site for awhile and appreciate your work. I have been a casual backpacker and have been started adding lightweight equipment this year. I am looking to upgrade my backpack. I do all my hiking on trails in the northeast. I am 5’8″ 175 pounds. When I am solo I can carry about 20 pounds, but when I take my children I will carry more like 35-40 pounds. I always liked the way external frames carry. I was considering the HMG southwest or windrider 3400; the z pack arc haul or osprey exos 58. Any advice on which light weight pack would also handle the heavier loads? Steve, no right answer on this one. Every body has a different tolerance for weight on shoulders & hips. For the 20 lb weight range I would suggest the HMG or ZP. The ZP is a good trail pack and will disribute more weight to your hips. The HMG is a tougher pack and more suited to off trail use and will be more durable over time. Our daughter will be hiking with me for about 6 days on the AT with a resupply at 3 days. She is a beginner backpacker. I anticipate her base weight will be 13 pounds. The bulkiest item she will have is the 20 degree EE Revelation, short, regular width and she will be carrying the Zpacks Duplex tent. She has been measured once for torso at 15″. I have asked her to get remeasured at 2 other outfitters so we can make sure the measurement is accurate. Which packs would you recommend for that torso length? From what I can tell the Exos 48 does not come in that short of a torso. I don’t want to spend the money for a Zpacks or HMG (the pack I use) since this will be her first time out and she may not like it. Cheri, that’s really tough one that has no exact answer, other than try it and see. My wife is 5’3″ with 16″ torso. She can generally get by with Medium pack. E.g. my wife is currently using a Z-Packs Arc Blast size medium 18-22 inch torso. It works fine for her 16″ torso on the lower end of it’s adjustment range. Thus in a similar way, the small Exos might fit your daughter when on the lower end of its adjustment range. Alan, which of these packs do you recommend for a small woman, 5’1″, 107 pounds? I usually carry around 20 pounds and sometimes up to 26 lbs in a Gossamer Gear mariposa on longer trips. Your site looks great…hadn’t checked it out in a long time. :) Wondering if you have any experience with packs that would carry ok with out using the hipbelt. My hubbie has a physical issue that came up that does not allow him to use a hipbelt…. My name is jason and I have a question. First off I’m a faily large guy being around 280lbs but that doesn’t mean I can’t hike all day non stop cause I can. I am having some trouble finding a backpack that fits larger people and still staying light. Furthermore I will be doing multi day hikes with my family so I want to stay around the 60L size so I can help carry the younger kids stuff but all around I wanna plan for around 40ish pounds total pack weight. Jason thanks for your kind comments about the site. And you know from reading here, that UL is a great option for somebody to shoulder a bit of weight for younger kids. My motto was everybody gets to have fun, including dad (which is another way of saying it isn’t fun for day if the total load is too much!). UL allows you to carry extra but still not have that load crush you! I am almost certain that ULA can do custom work to get a pack that fits you (if their largest standard option doesn’t suit), but give them a call to make sure. And it is also possible that HMG will custom make a custom pack as well. I am torn between the MLD Exodus, the ULA Ohm 2.0 and the Exos 48. What is your take on a bag that could allow me to carry up to 30lbs if I wanted to do an overnighter with the wife and carry a heavier load and still have the ability to reduce that by 10lbs when solo section-hiking the AT? Thanks for a great website as well. Alan – I would be interested in your thoughts on a good winter pack for the Adirondacks, White Mountains, and Mount Rainier. I used an older version of the GG Mariposa last winter in ADK’s but it was not ideal. I was looking at HMG Porter and CiloGear 45L Worksack (expands to 70L). Sorry for the late reply John. Was out doing a section hike of the AT with Alison. Which Hyperlite Mountain Gear Pack would be based on the expected volume of your load. The 3400 porter would be fine and give you plenty of room for gear. My preference is always for pockets so I would probably go with the 3400 southwest, but that’s just me. I know many purist climbers abhor external pockets. All the best this winter in the ADKs. Added Arc Blast and Haul to the list. Zpacks: At around 1.5 pounds the Arc Haul and the Arc Blast from Z-packs, would be a good choice for trail hiking. Especially those with sensitive shoulders that want to transfer the maximum weight to the hip belt.. Its in the middle of the paragraph .